Our PURINA® BETA® Senior dry dog food is 100% complete and balanced nutrition that has been specially formulated for senior dogs by PURINA® vets and nutritionists to support active mobility. Helping to keep your senior dog's enthusiasm for life, our delicious recipe is packed with essential nutrients to help support your senior dog's natural defences so he can continue to be happy and full of vitality. Balanced levels of protein and fat helps him to maintain a lean body condition. Active mobility and joint health are important at this stage in your older dog's life, which is why we've included omega 3 fatty acids, also antioxidants which help support your dog's vital organs and his natural defences and vitamins in our PURINA® BETA® Senior dry dog food. The dual size kibbles encourage chewing and prepares the food for digestion. To support healthy ageing for your senior dog. With omega 3 fatty acid to support healthy joints. With essential amino acids to help support vital organ function. With antioxidants to help support natural defences. Just because your dog is in his golden years, doesn't mean living an active, curious life should stop for him. That's why our PURINA BETA® tailored nutrition for Senior adult dogs includes Omega 3 fatty acids to help support joint mobility and antioxidants to help support natural defences. It is also specially formulated with selected natural ingredients and a natural prebiotic to help support digestive health... so he is still ready to go every time you pick up the lead! And all this without including any added artificial colours, flavours or preservatives. 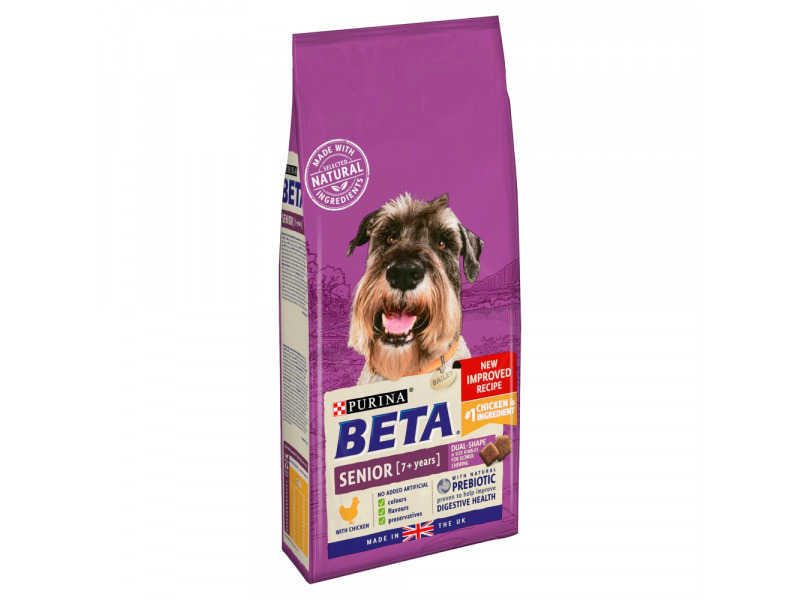 There are currently no questions for PURINA BETA Senior With Chicken Dog Food - be the first to ask one!